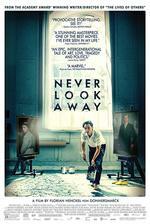 "At a daunting 188 minutes long, Never Look Away takes its time, doesn't force its themes. Like one of those novels that follows a family through multiple generations, NEVER LOOK AWAY follows Kurt from Dresden, to Düsseldorf, to Berlin." "The lines between good and evil are clearly demarcated at the outset and remain more or less fixed as the story progresses, a strategy that in no way compromises the filmmaker’s ability to mine fresh complications and surprises from his story." "The title of NEVER LOOK AWAY is deliciously ironic: This is one of the most mesmerizing, compulsively watchable films in theaters right now."